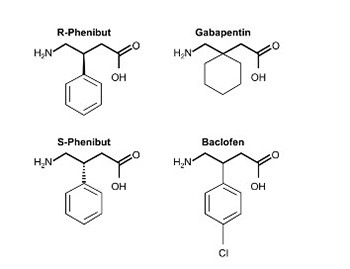 Phenibut is a glutamic acid derivative with activity on the γ-aminobutyric acid (GABA)B, A, and B-phenethylamine receptors. It is prescribed in former Communist Bloc countries for anxiolysis and related psychiatric disorders. It can be easily obtained in Western countries and is thought to have abuse potential. Abrupt discontinuation has been reported to precipitate an abstinence syndrome. A review of the literature identified 22 reported cases, many of which were notable for severe psychomotor agitation and requirements for aggressive pharmacologic treatment. Neurologic and autonomic signs and symptoms may mimic serotonin or neuroleptic malignant syndrome. Patients were typically younger and had coexisting substance abuse disorders to other drugs. Also presented is a case of a 23-year-old male with an acute phenibut abstinence syndrome. This patient exhibited severe psychomotor agitation requiring physical restraints, dexmedetomidine, lorazepam, haloperidol, diphenhydramine, cyproheptadine, melatonin, olanzapine, and baclofen for symptom control.